This design may look harder than it really is. 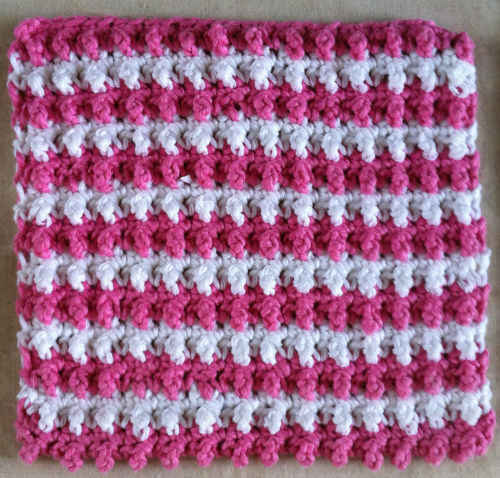 The little pebbles are created by crocheting a treble crochet stitch and then a single crochet stitch in the next stitch. The height of the treble stitch next to the single crochet stitch makes it puff out – creating the pebble effect. Follow me onto Dishcloth #5 for more of the story…. Size: About 9 inches square. Row 2: Ch 1, turn, sc in each st across. (29 sc) Change color to White in last st. Drop White to back of work. Row 4: Ch 1, turn, sc in each st across. (29 sc) Pick up dropped color in last st. Drop old color to back of work. 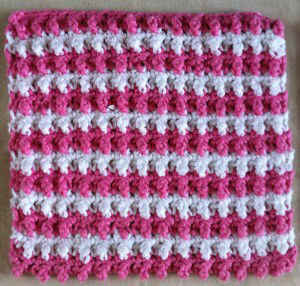 Rows 6-25: Rep Pattern Rows 2-3 ten times, alternating colors every two rows, ending with Pink. Row 26: With Pink, ch 1, turn, sc in each st across. (29 sc) Finish off and weave in ends. 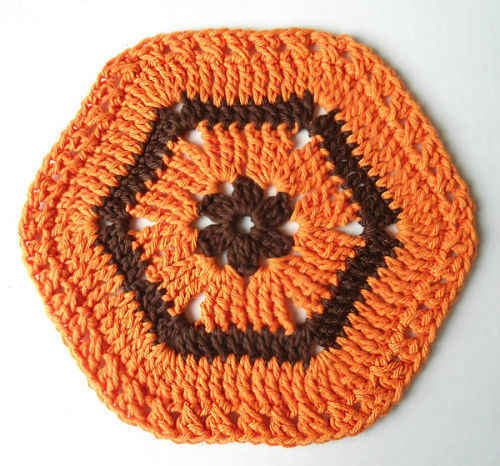 My favorite so far to actually use as a dishcloth! Or any other cleaning purpose. The bobbles will make good scrubbers 🙂 Again, lazy crocheter that I am, I used a variegated yarn so I didn’t have to change colors… it’s a great size and looks really nice. I might make some of these for Christmas gifts! This is my very favorite pattern. Thank you!